Today Google announced about a new product that was developed here in Israel called Google Insights. It can be used to analyze searches on different subjects by countries. 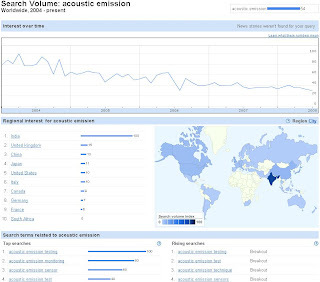 I am sending you such a search regarding Acoustic Emission. You can see where people were more interested in the technology. Most are coming from India. But another interesting parameter is that the global interest for AE (according to Google Insights) is reducing almost 5 times since 2004. It is intersting information but I think that it is too early to come to this conclusions based on Google, since they only started and I found some other questions. For example there zero rearches of AE from Russia and Israel. לצורך קידום שיטת פליטה אקוסטית בישראל נפתחה קבוצת דיון בנושא.